After much discussion, plans for the new building were finalised. A new contractor has been selected and is in the process of ordering materials. The plans are going through the permit process and as soon as they are approved construction will begin. We are hopeful to have the building under roof before winter sets in. 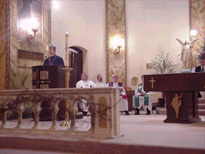 On Tuesday, September 11th Bishop Job asked all parishes in the Diocese of Chicago to have a Prayer Service in times of distress for the those victims of the terrorist attack. Fr. 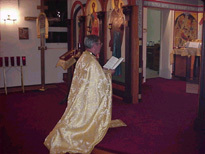 Andrew knelt in prayer calling for help from God during this difficult time. 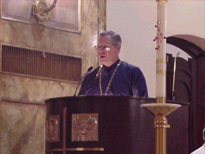 On Friday, answering the call of President Bush, a candle light vigil was held at St. Luke. 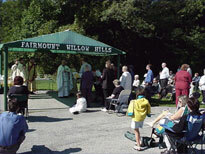 Reader John Adamovich read the Psalms of the Ninth Hour and Fr. 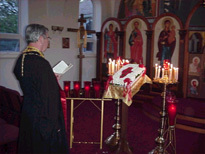 Andrew gave a meditation of our personal experiences during this week. 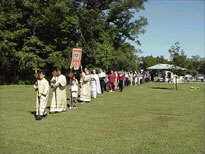 On Sunday St. Luke participated in an ecumenical prayer service with clergy of other faith groups at Sts. 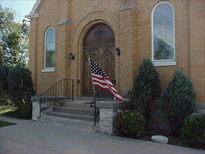 Cyril and Methodius Catholic Church in Lemont, Illinois. Fr. 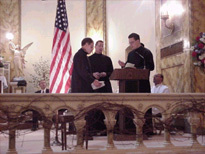 Andrew did the Litany for the departed while Deacon Andrew Werbiansky, Readers Herman Kincaid and Michael Bauml sung the memorial hymn. 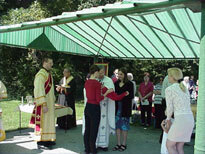 On Sunday September 2nd 2001 St. Luke parish held Divine Liturgy at the Fairmount - Willow Hills Memorial Park at 95th St. and 104th Ave. 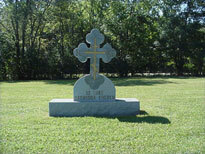 Recently St. Luke Purchased a section of lots establish a parish cemetery. 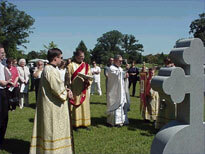 A monument was purchased and installed. 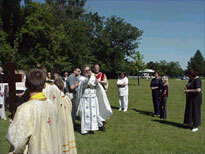 Following Divine Liturgy Father Andrew led a procession to the St. Luke section where he blessed the lots and monument. 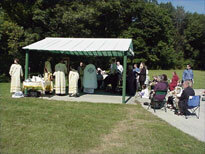 (See Prayer of Week) Anyone wishing to purchase lots in the St. Luke section should contact Father Andrew or Roslyn Stevens. As these lots are sold the plan is to purchase additional lots to expand the section.